for an elderly person to move through. Studies show one of the biggest fears seniors have is losing independence. Aging often leads to the inability to maintain independence and continue living in their homes. And this is a valid concern as many seniors can't age in place due to mobility issues. However, taking steps to increase mobility can help to preserve senior independence and allow seniors to age in place. Decreased ability to safely move through the home can lead to the need for extra care. As we age we often slow down and lose our ability to get around. This can be made worse through illness or injury. Slips and falls occur in over a third of the senior population. However, there is no reason to simply accept this as a fact of growing older. There are many things which can help seniors maintain their independence. Being able to maintain and even increase the ability to move around on their own is the number one way seniors can live in their homes and continue aging in place. Caregivers and concerned family members need to take the time to carefully assess the needs of the senior in their life and make changes to their home, lifestyle, and more to allow greater independence. Do not make the mistake of assuming this problem has a “one size fits all” solution. There are many different factors which should be considered when helping seniors preserve independence and maintain or increase mobility. These factors can include but are not limited to: age, health status, gender, activity level of the senior, and the home the senior lives in. Each of these factors should be gone over carefully so issues can be dealt with in the best possible way for that particular senior. Often time’s caregivers and family members will immediately decide the senior must leave their home if they are having mobility issues. This does not have to be the case. There are a number of different products which can help make any home much easier for an elderly person to move through. Stander Products offer a security pole which is tension mounted between the floor and the ceiling. 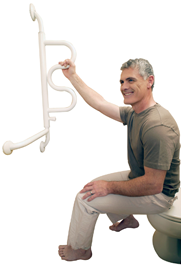 Attached to the pole is a curved grab bar which allows the senior to easily grab it while standing up or sitting or lying down (for extra balance). This product can easily be mounted in several different places throughout the home. In addition, there are canes, walkers, bed rails, grab bars and handles and other products which can customize a home to make it easier and safer for any senior to get around in. The right products can provide greater senior independence. Finally, it is important that caregivers and family members understand this can be a dynamic process which can change quickly. Often times a senior may have little or no difficulty moving throughout their home and then quickly experience a change in mobility. This can happen when an illness or injury happens. In addition, simply growing older can often bring about changes in the ability to move around the home. This makes it crucial that mobility is assessed as an ongoing issue so changes can be made which will help the senior preserve their independence and maintain their mobility. About The CareGiver Partnership. The CareGiver Partnership helps caregivers and their loved ones with answers to their caregiving questions, including information about home health care products and supplies, from our Wisconsin-based team of Product Specialists who are all current or former caregivers. The company’s Web site provides the largest online library of resources on subjects most important to caregivers — from arthritis to assisted living, and Parkinson’s to prostate cancer — as well as access to more than 3,000 home care products for incontinence, skin care, mobility, home safety and daily living aids. The CareGiver Partnership was founded in 2004 by Lynn Wilson of Neenah, Wisc. Visithttp://www.caregiverpartnership.com to learn more or call 1-800-985-1353. Is This the Answer to Your Leakage Problem? Are You 1 in 3... Like Me?